G.H. 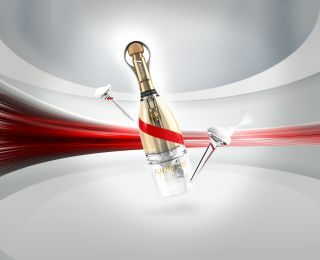 Mumm's "Grand Cordon Stellar" was designed to be imbibed in zero gravity. The Champagne will go on sale in September 2018. Space tourists could soon celebrate their arrival in the final frontier with a few glasses of bubbly. France-based Champagne maker G.H. Mumm and the design startup Spade have invented a way to drink the stuff in microgravity, and it's a lot more formal and celebratory than jabbing a straw into a pouch. The new system consists of a specially designed bottle that harnesses Champagne's gas pressure to push the liquid out through a frame. Drinkers then capture this floating sphere of alcoholic foam in a custom-made glass, whose interior holds onto the Champagne via surface tension. The system will officially debut in September 2018, with the launch of Mumm's "Grand Cordon Stellar." "For the last 40 years, space travel has been shaped by engineers rather than designers. Instead of seeing zero gravity as a problem to be solved, we look at it as a design possibility," Spade founder Octave de Gaulle said in a statement. "The big design challenge for Mumm Grand Cordon Stellar was actually getting the liquid out of the bottle." Mumm Grand Cordon Stellar should soon be available to passengers aboard the weightlessness-inducing airplane flights operated by French company Air Zero G, Mumm representatives said. Discussions are ongoing to provide the Champagne on future commercial spaceflight missions, they added. And, in case you're wondering: The Champagne-drinking experience is much different in zero gravity than it is on the ground. "It's a very surprising feeling," Mumm Cellar Master Didier Mariotti said in the same statement. "Because of zero gravity, the liquid instantly coats the entire inside of the mouth, magnifying the taste sensations," added Mariotti, who sampled some Grand Cordon Stellar during an Air Zero G flight. "There's less fizziness and more roundness and generosity, enabling the wine to express itself fully." Mumm isn't the only company working to take happy hour off Earth. For example, the Australian company 4 Pines Brewing has teamed up with an engineering company to develop a special microgravity bottle for its "Vostok Space Beer." And last year, Budweiser announced that it aims to brew the first beer on Mars.